I mentioned Menna’s Joint in my list of Kalamazoo’s best sandwiches, but I think for some context I should recap it here. Menna’s is a sandwich joint which serves up a variety of big wraps to the college crowd at Michigan State University and Western Michigan University. They’re open pretty much around the clock, and they deliver. Menna’s recipe strategy is generally combining a lot of potatoes, cheese, chicken tenders, bacon and sour cream is a burrito-style wrap. It’s not exactly inspired, but these “dubs” are hearty, tasty and filling. Also, this is their mascot, which basically tells you everything you need to know about Menna’s and a lot of their clientele. But Menna’s seems to have branched out a bit. Following a tip from a friend, I checked out their latest creation, the Turkey Dub. It’s a holdiay-themed wrap which includes turkey, potatoes, stuffing and gravy. It’s not an outlandish idea; the internet is rife with similar recipes for Thanksgiving leftover sandwiches. 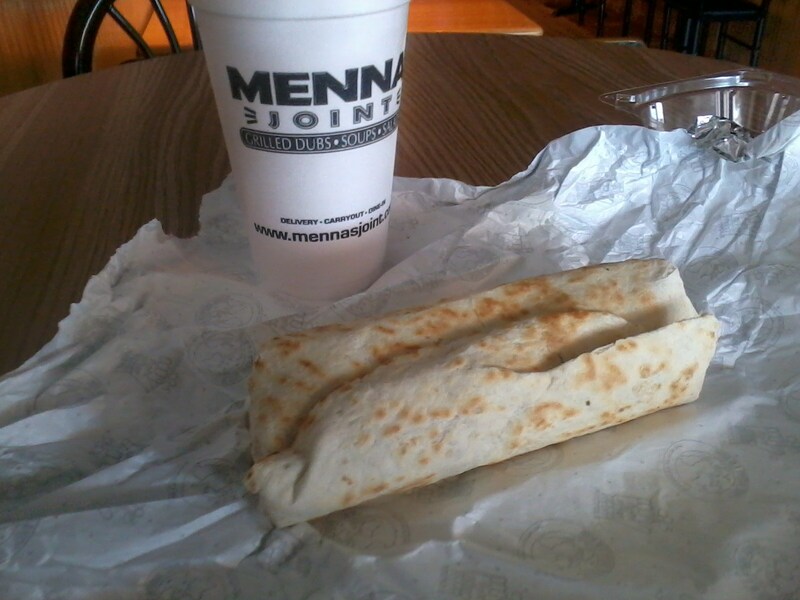 But Menna’s doesn’t ever do anything halfway, so I decided to give it a shot. Trust me, they’re actually really good. Honest. It was actually pretty good!! The turkey was of a decent quality, and while the stuffing was from a box recipe, it was filling and flavorful. Potatoes, which are always a strength of Menna’s wraps, are well used. The gravy keeps the dub from being too dry, but otherwise doesn’t lend very much to the overall flavor. I would’ve liked them to take the theme even further by including cranberry sauce, as a way to introduce an opposing flavor, but since they’re already going out on a bit of a limb I can’t really blame them. The Turkey Dub was a worthwhile meal, all things considered. Like most of the fare from Menna’s, it’s a little much to eat in one sitting but not nearly enough for two meals. But it’s a tasty enough exercise in Thanksgiving sandwich making, and worth checking out before it disappears at the end of the year.